If you’re at work or school, you won’t be able to access video streaming websites. Companies and schools block access to popular sites intentionally so as to increase the productivity of the employees or make students concentrate on their studies. Frankly speaking, YouTube, Hulu are not the only websites through which you can watch TV shows, or live Soccer or Cricket matches for free. You can easily unlock them with Android VPN clients. Some TV channels and media companies have launched apps through which you can watch top television shows on a mobile device. The applications allow you to watch TV shows of your choice. 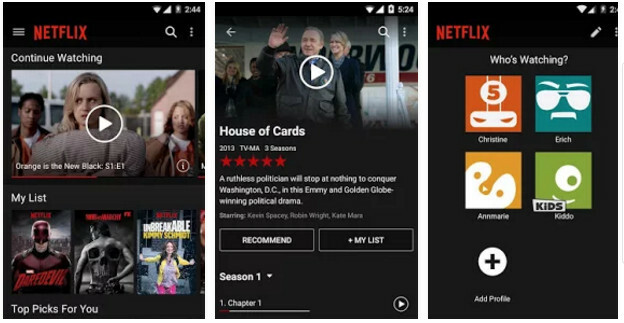 Several developers have published video streaming apps on the Google Play Store. But the best live TV apps in India among them are mentioned below. Note: To watch videos seamlessly, the user must use the video streaming applications only when a 3G or 4G connection is active. 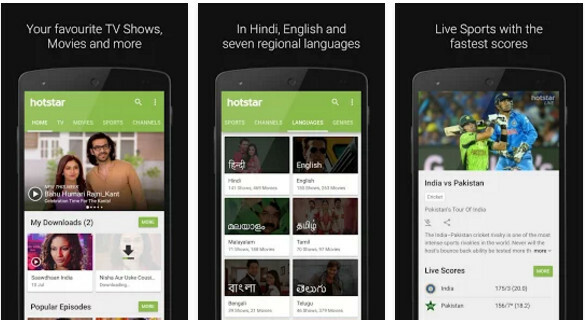 Hotstar is a popular Indian live TV app with which you can watch your favorite live sports events and TV serials on a mobile phone for free. Apart from TV shows, this application lets you watch movies in eight languages. When a cricket match is live, Hotstar will make you aware of the latest scores. If you’re a big fan of English TV shows such as Game of Thrones, Veep, American Horror story, etc, then you should begin using Hotstar because the application lets users watch top English shows aired in the US, UK, Australia, and other countries. Hotstar has over 50 million users. It is compatible with Android 4.0 and later operating systems. JioTV service was launched in 2016 by Reliance subsidiary JIO INFOCOMM. Within 20 to 30 months, it has become one of the fastest growing live TV apps in India. 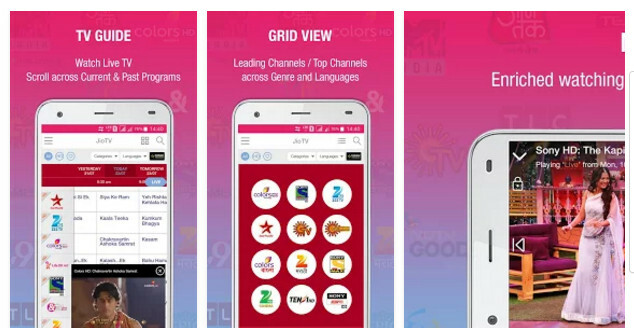 The Indian Live TV app from Reliance group enables you to watch popular TV shows aired on channels such as Sony TV, Colors, ZEE TV, Set Max, etc for free. It has a user-friendly UI. It gives you access to over 350 channels in various languages and over 55 high-definition channels. JioTv lets you switch the interface language from English to Hindi, Tamil, etc. It has a cool feature through which you can watch TV shows aired in the last 7 days. You can also go through the schedule of your favorite channels with the free JioTV app for Android. JioTV supports Android 4.1 and higher operating system. It has over 10 million active users. 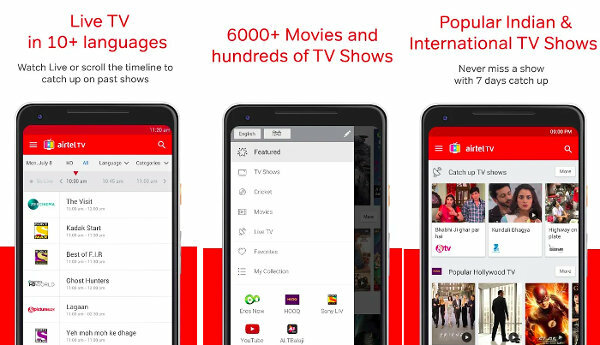 Airtel TV is a free app that enables users to watch 205+ channels. Unlike Jiotv which is restricted to the users of JIO SIM cards, Airtel TV is available for everyone. To provide a good experience to the users, the application checks the mobile data/WiFi connection speed and sets the video streaming quality automatically. The app allows you to watch top rated Bollywood/Hollywood movies, trailers of upcoming movies, original content, etc. It lets you pause/resume the live streaming. It has filters, TV guide module, search utility, and an option to create watchlist/playlist. Developed and maintained by one of the largest media companies in India i.e. 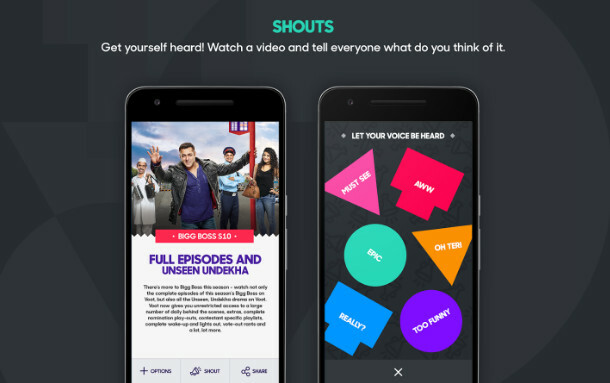 Viacom, Voot has over 5 million users. It a powerful on-demand video streaming platform that gives users access to TV shows such as Big Boss, Comedy Nights Bachao, Comedy Nights with Kapil, etc for free. Voot has a large collection of blockbuster movies featuring your favorite artists. Your children will love the app because Voot provides access to popular kids TV shows such as Motu Patlu, Pokemon, Doraemon, etc. Like other applications we have mentioned above, Voot has a great interface. Voot supports Google Chromecast and it is fully compatible with tablets. It works on mobile devices running on the Android 4.2+ operating system. Other top apps for watching Indian Live TV shows and movies are YuppTV, DittoTV, OZEE, NexGTV. You can download these four applications for Android here on the Play Store. Amazon, the eCommerce giant had introduced its video streaming services in India last year. Amazon’s video streaming app allows users to download movies and popular TV English TV shows for offline viewing. 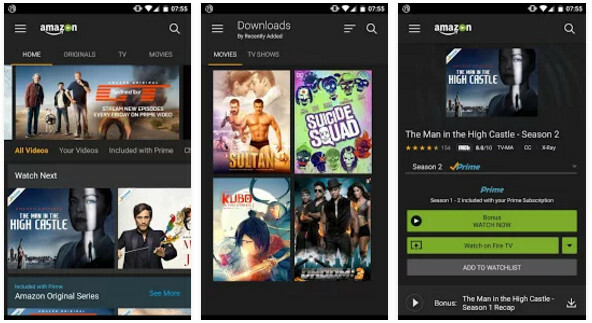 According to its official listing on the Google Play Store, Amazon Prime has a collection of top-grossing movies such as Sultan, Dhoom 3, Suicide Squad, etc. The application comes integrated with IMDB. Hence, you can find other movies featuring your favorite actors, actresses, villains, etc. Netflix is a great alternative to the above Indian live TV apps. Once you register an account with Netflix, the application will enable you to watch thousands of movies and TV shows on your mobile device. Netflix has the option to find movies or shows by their name. It lets you rate videos. Hence, you can find top-rated movies or shows quickly on the mobile device. Netflix India has very cheap subscription plans. Conclusion: When you’re at a public place or office, you can easily watch a TV show or live match featuring your favorite team if you install one of the 1st three Indian Live TV apps on your Android device. If your internet connection is slow, use Android news apps to get live scores and news on your favorite shows. If you’re searching for an application to watch English content, download and use Amazon Prime or Netflix.